From now until Monday, March 16th, Minted is having a sale! 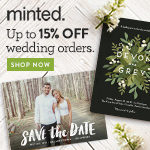 They are offering 15% off of the entire site - from invitations to save the dates, everything is on sale. But wait, it gets better: I am raffling off two fabulous prizes: one lucky winner will win $250 towards Minted and one runner up will receive $100 towards Minted! To enter, all you have to do is comment below with your name and tell us what you would buy from Minted. I will announce the two lucky winners on Monday, April 13th. If you need some inspiration, check out these gorgeous designs, or click here to explore the site yourself! There are so many things! Thank you cards, table numbers, programs are just a few to name. I am getting ready to order my wedding invitations and would LOVE to order from minted. The prize would help me order something beyond my budget which would be amazing. I might be able to get my thank you cards as well. Thanks! Yes please!! I plan on getting my invitations and RSVP cards from minted. Love that they will print addresses so no one has to see my chicken scratch! Rebecca,you won! 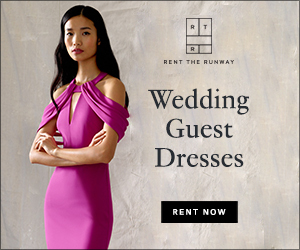 Please send me an email at misse @ honeybeeweddings .com to claim your prize!